Figure 6.5. Plots of % O2 versus time based on rock abundance modeling (Berner and Canfield, 1989) and RROD isotope mass balance modeling with rapid recycling and O2-dependent C and S isotope fractionation. The adjustable parameters J and n refer to the isotope dependence of fractionation for C and S isotopes, respectively (Berner, 2001). Figure 6.6. Comparison of carbon isotope fractionation a13C over time for the RROD model with measurements of a13C by Hayes et al. (1999) on Phanerozoic carbonates and organic matter. Figure 6.7. Comparison of results for % O2 for the past 150 million years between the model of Hanson and Wallmann (2003) and RROD isotope mass balance modeling (Berner, 2001). can be explained by the lack of consideration of these factors by the simple isotope model. The results for O2 level over Phanerozoic time, calculated via the a priori model of Bergman et al. 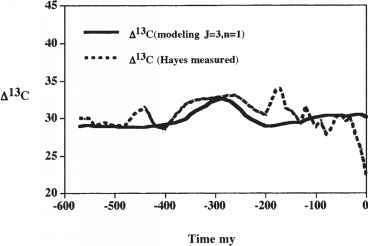 (2003), are compared to the results of RROD modeling in figure 6.8. Both models show a large rise in percent O2 during the mid-Paleozoic, attaining a maximum near the Permian-Carboniferous boundary. However, the Bergman model shows another equally high maximum in the Cretaceous not obtained by RROD isotope modeling.